Utility class for creating new RC entries. Deprecate access to mAttribs (direct or via getAttributes). Right now we're having to include both rc_comment and rc_comment_text/rc_comment_data so random crap works right. Definition at line 69 of file RecentChange.php. 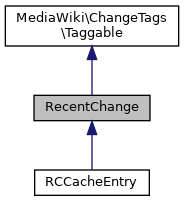 Tags to append to the recent change, and associated revision/log. Definition at line 1211 of file RecentChange.php. Definition at line 1154 of file RecentChange.php. Gets the end part of the diff URL associated with this object Blank if no diff link should be displayed. Definition at line 1117 of file RecentChange.php. Mark this RecentChange as patrolled. Definition at line 590 of file RecentChange.php. References $auto, $tags, $wgUseFilePatrol, $wgUseNPPatrol, $wgUseRCPatrol, getAttribute(), User\getName(), getTitle(), User\isAllowed(), null, RC_LOG, RC_NEW, reallyMarkPatrolled(), PatrolLog\record(), and Hooks\run(). Definition at line 1078 of file RecentChange.php. References $name, $user, CommentStore\getStore(), User\newFromAnyId(), and null. Referenced by RCCacheEntryFactory\buildDiffLink(), doMarkPatrolled(), ChangesList\getDataAttributes(), EnhancedChangesList\getDiffHistLinks(), SpecialWatchlist\getLatestSeenTimestamp(), MachineReadableRCFeedFormatter\getLine(), parseParams(), reallyMarkPatrolled(), and SpecialWatchlist\registerFilters(). Definition at line 1107 of file RecentChange.php. Definition at line 182 of file RecentChange.php. Referenced by ApiQueryWatchlist\getAllowedParams(), and ApiQueryRecentChanges\getAllowedParams(). Returns the change size (HTML). The lengths can be given optionally. Definition at line 1140 of file RecentChange.php. Definition at line 540 of file RecentChange.php. Definition at line 1030 of file RecentChange.php. References $name, $params, null, and parseParams(). Get the User object of the person who performed this change. Definition at line 344 of file RecentChange.php. References $mPerformer, User\newFromActorId(), User\newFromId(), and User\newFromName(). Referenced by SpecialWatchlist\getLatestSeenTimestamp(), notifyRCFeeds(), and save(). Return the tables, fields, and join conditions to be selected to create a new recentchanges object. Definition at line 280 of file RecentChange.php. Referenced by SiteStatsUpdate\cacheUpdate(), SpecialRecentChangesLinked\doMainQuery(), SpecialRecentChanges\doMainQuery(), SpecialWatchlist\doMainQuery(), ChangesListSpecialPage\doMainQuery(), NewPagesPager\getQueryInfo(), MediaWiki\Tests\Storage\PageUpdaterTest\getRecentChangeFor(), and RecentChangesUpdateJob\purgeExpiredRows(). Definition at line 331 of file RecentChange.php. Referenced by RCCacheEntryFactory\buildCLink(), RCCacheEntryFactory\buildCurLink(), RCCacheEntryFactory\buildDiffLink(), RCCacheEntryFactory\buildLastLink(), doMarkPatrolled(), OldChangesList\formatChangeLine(), EnhancedChangesList\getDiffHistLinks(), SpecialWatchlist\getLatestSeenTimestamp(), IRCColourfulRCFeedFormatter\getLine(), MachineReadableRCFeedFormatter\getLine(), EnhancedChangesList\getLineData(), EnhancedChangesList\makeCacheGroupingKey(), reallyMarkPatrolled(), and save(). Check whether the given timestamp is new enough to have a RC row with a given tolerance as the recentchanges table might not be cleared out regularly (so older entries might exist) or rows which will be deleted soon shouldn't be included. Definition at line 1180 of file RecentChange.php. Referenced by DifferenceEngine\getMarkPatrolledLinkInfo(), Article\showPatrolFooter(), and RecentChangeTest\testIsInRCLifespan(). Initialises the members of this object from a mysql row object. Definition at line 1040 of file RecentChange.php. References $user, DB_REPLICA, CommentStore\getStore(), User\newFromAnyId(), null, wfGetDB(), and wfTimestamp(). Mark a given change as patrolled. Definition at line 565 of file RecentChange.php. Constructs a RecentChange object for the given categorization This does not call save() on the object and thus does not write to the db. Definition at line 957 of file RecentChange.php. References $params, $user, WikiPage\factory(), Title\getArticleID(), Title\getDBkey(), Title\getNamespace(), Title\getPrefixedDBkey(), null, RC_CATEGORIZE, and serialize(). Referenced by ApiQueryRecentChangesIntegrationTest\testCategorizeTypeParameter(), ApiQueryWatchlistIntegrationTest\testCategorizeTypeParameter(), and RecentChangeTest\testHiddenCategoryChange(). Find the first recent change matching some specific conditions. Definition at line 205 of file RecentChange.php. References $fname, null, and wfGetDB(). Referenced by CategoryMembershipChangeJobTest\getCategorizeRecentChangeForRevId(), DifferenceEngine\getMarkPatrolledLinkInfo(), Revision\RevisionStore\getRecentChange(), and Article\showPatrolFooter(). Definition at line 192 of file RecentChange.php. Referenced by ApiPatrol\execute(), MarkpatrolledAction\getRecentChange(), ApiTag\processIndividual(), and PatrolLog\record(). Definition at line 135 of file RecentChange.php. Referenced by ApiQueryRecentChanges\extractRowInfo(), MediaWiki\Tests\Storage\PageUpdaterTest\getRecentChangeFor(), SpecialRecentChanges\outputChangesList(), SpecialWatchlist\outputChangesList(), and RecentChangeTest\testNewFromRow(). Definition at line 863 of file RecentChange.php. References $params, $title, $type, $user, $wgRequest, null, and RC_LOG. Referenced by ManualLogEntry\getRecentChange(), LogPage\saveContent(), and RCFeedIntegrationTest\testNotify(). Makes an entry in the database corresponding to an edit. Definition at line 685 of file RecentChange.php. References $title, $user, DeferredUpdates\addCallableUpdate(), DB_MASTER, null, DeferredUpdates\POSTSEND, RC_EDIT, use, and wfGetDB(). Referenced by MediaWiki\Storage\PageUpdater\doModify(), and ImportTextFiles\execute(). Definition at line 830 of file RecentChange.php. References $params, $title, $type, $user, and $wgLogRestrictions. Definition at line 759 of file RecentChange.php. References $title, $user, DeferredUpdates\addCallableUpdate(), DB_MASTER, null, DeferredUpdates\POSTSEND, RC_NEW, use, and wfGetDB(). Referenced by MediaWiki\Storage\PageUpdater\doCreate(), and ImportTextFiles\execute(). Notify all the feeds about the change. Definition at line 497 of file RecentChange.php. References $params, $wgRCFeeds, as, RCFeed\factory(), getPerformer(), null, and RC_EXTERNAL. Definition at line 171 of file RecentChange.php. Referenced by ApiQueryWatchlist\extractOutputData(), ApiQueryRecentChanges\extractRowInfo(), MachineReadableRCFeedFormatter\getLine(), and RecentChangeTest\testParseFromRCType(). Parses and returns the rc_params attribute. Definition at line 1193 of file RecentChange.php. Referenced by MachineReadableRCFeedFormatter\getLine(), and getParam(). Definition at line 149 of file RecentChange.php. References $t, $type, and as. Referenced by ApiQueryWatchlist\run(), ApiQueryRecentChanges\run(), and RecentChangeTest\testParseToRCType(). Mark this RecentChange patrolled, without error checking. Definition at line 647 of file RecentChange.php. References DB_MASTER, getAttribute(), getTitle(), and wfGetDB(). Writes the data in this object to the database. For compatibility reasons, the SEND_ constants internally reference a value that may seem negated from their purpose (none=true, feed=false). This is because the parameter used to be called "$noudp", defaulting to false. Definition at line 369 of file RecentChange.php. References $editor, $mAttribs, $title, $user, $wgPutIPinRC, $wgShowUpdatedMarker, $wgUseEnotif, ChangeTags\addTags(), as, DB_MASTER, getPerformer(), CommentStore\getStore(), getTitle(), RecentChangesUpdateJob\newCacheUpdateJob(), User\newFromAnyId(), ActorMigration\newMigration(), notifyRCFeeds(), null, RC_CATEGORIZE, Hooks\run(), JobQueueGroup\singleton(), use, and wfGetDB(). Return the list of recentchanges fields that should be selected to create a new recentchanges object. Definition at line 228 of file RecentChange.php. References $wgActorTableSchemaMigrationStage, CommentStore\getStore(), SCHEMA_COMPAT_READ_NEW, and wfDeprecated(). Definition at line 317 of file RecentChange.php. Definition at line 324 of file RecentChange.php. Definition at line 121 of file RecentChange.php. Line number of recent change. Definition at line 111 of file RecentChange.php. Definition at line 92 of file RecentChange.php. Referenced by getAttributes(), and save(). Definition at line 93 of file RecentChange.php. Definition at line 103 of file RecentChange.php. Definition at line 98 of file RecentChange.php. Definition at line 106 of file RecentChange.php. Definition at line 105 of file RecentChange.php. List of tags to apply. Definition at line 116 of file RecentChange.php. Referenced by addTags(), and doMarkPatrolled(). Definition at line 80 of file RecentChange.php. Referenced by ChangesListSpecialPage\__construct(), WikiPage\commitRollback(), WikiPage\doEditContent(), ApiQueryWatchlist\extractOutputData(), ApiQueryRecentChanges\extractRowInfo(), ApiQueryUserContribs\extractRowInfo(), WatchedItemQueryService\getWatchedItemsWithRCInfoQueryFilterConds(), McrUndoAction\onSubmit(), ApiQueryUserContribs\prepareQuery(), MediaWiki\Tests\Storage\PageUpdaterTest\provideSetRcPatrolStatus(), ApiQueryRecentChanges\run(), RevDelLogItem\setBits(), and RevDelRevisionItem\setBits(). Definition at line 79 of file RecentChange.php. Definition at line 78 of file RecentChange.php. Referenced by ChangesListSpecialPage\__construct(), ApiQueryWatchlist\extractOutputData(), ApiQueryRecentChanges\extractRowInfo(), ApiQueryUserContribs\extractRowInfo(), DifferenceEngine\getMarkPatrolledLinkInfo(), NewPagesPager\getQueryInfo(), NewFilesPager\getQueryInfo(), Revision\RevisionStore\getRcIdIfUnpatrolled(), WatchedItemQueryService\getWatchedItemsWithRCInfoQueryFilterConds(), ApiQueryUserContribs\prepareQuery(), MediaWiki\Tests\Storage\PageUpdaterTest\provideSetRcPatrolStatus(), and ApiQueryRecentChanges\run(). Definition at line 76 of file RecentChange.php. Referenced by ChangesListSpecialPage\__construct(), and CategoryMembershipChangeJob\run(). Definition at line 72 of file RecentChange.php. Referenced by ChangesListSpecialPage\__construct(), PopulateRecentChangesSource\buildUpdateCondition(), ChangesList\getDataAttributes(), RebuildRecentchanges\rebuildRecentChangesTablePass1(), and RebuildRecentchanges\rebuildRecentChangesTablePass2(). Definition at line 75 of file RecentChange.php. Definition at line 74 of file RecentChange.php. Referenced by ChangesListSpecialPage\__construct(), PopulateRecentChangesSource\buildUpdateCondition(), ChangesListSpecialPage\execute(), ChangesList\getDataAttributes(), and RebuildRecentchanges\rebuildRecentChangesTablePass3(). Definition at line 73 of file RecentChange.php.